A. This is meant to be a mysterious location, seen, at first, in almost complete darkness, and then only in shadows, emerging to look like some sort of sinister, desolate, frozen-in-time village. But once the lights come on, it turns out to be only a retirement community. A. Somewhere near Tampa, Florida. A. In Episode 3 ("Optics"), at 11:28. 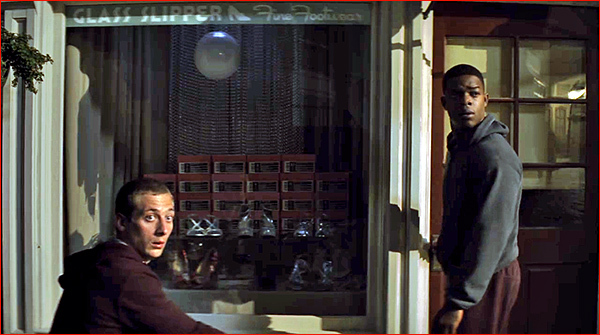 Two of the veterans being treated at the Homecoming facility, Walter Cruz ( Stephan James ) and his friend, Joe Shrier ( Jeremy Allen White ), sneak out of the facility, steal a van, and head out on the road. Why? Because Joe is paranoid about the Homecoming program ( justifiably so, as it turns out ). He thinks they won't be allowed to leave, and he tells Walter that, for all they know, they might not even really be in Florida. 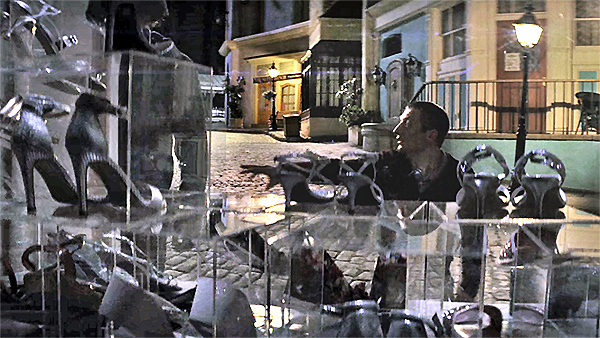 So, Walter takes Joe out of the facility, after dark, to prove him wrong, and to show him they really are in Florida. 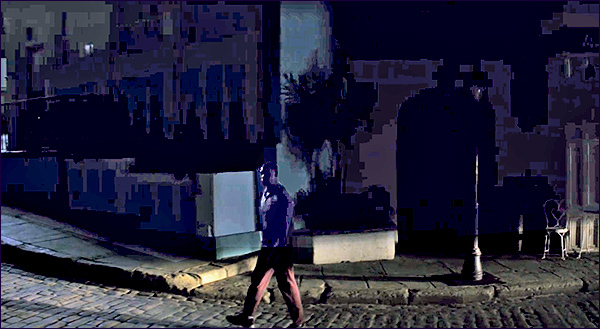 After driving through the night for a long time, they finally arrive at an unknown location, where they stop to investigate, not knowing what they're going to find. They find themselves in what looks like a completely deserted European village, complete with a cobblestone street. It's too dark to see much, and by now, their imaginations are so worked-up that they are half-convinced it is some sinister mock town designed for some kind of malevolent military training program. 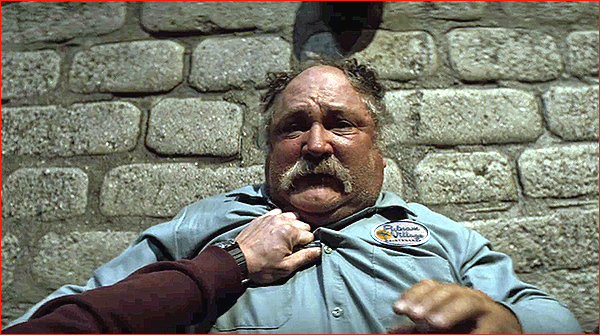 So, when the lights finally go on, and they spot a figure at the end of the street, Joe overreacts and tackles the guy. Unfortunately, it turns out to be just an aging night watchman making his rounds, and the village turns out to be nothing more than a normal retirement community (called "Putnam Village") , where the senior residents have all simply gone to bed for the night. And yes, it's in Florida. A. This one was somewhat disappointing ( especially after all the build-up ), insofar as it is the only exterior filming location on this list that wasn't out in the real world. 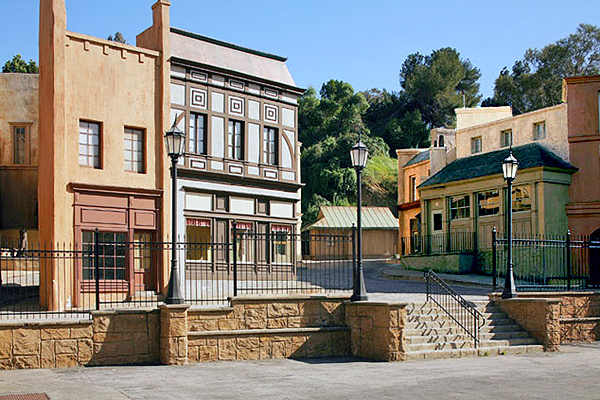 Instead, this village scene was shot on an outdoor set on the back lot of Universal Studios Hollywood, the exact same back lot that you can tour aboard the tram, when you visit the Universal theme park. This particular outdoor set is known as "Little Europe", and you've probably seen it before on TV, even if you've never taken Universal tour. 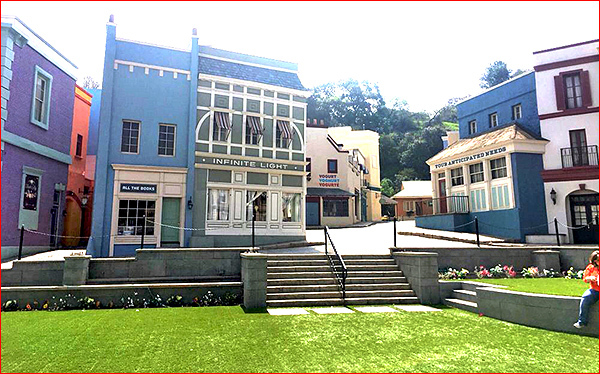 It's currently used to film the heaven scenes on the hit NBC sitcom "The Good Place". Here is an aerial view of Little Europe, via Google Maps. 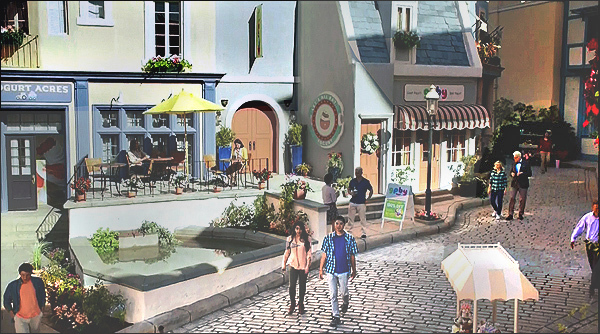 For most of it's life, Little Europe looked like a fairly traditional European street ( where they've filmed a host of movies over the decades, from "Dracula" to "Pirates of the Caribbean" ), but in 2016 they redecorated it for "The Good Place" by making it look much more colorful, painting in bright pastel colors, and adding flowers and fountains. 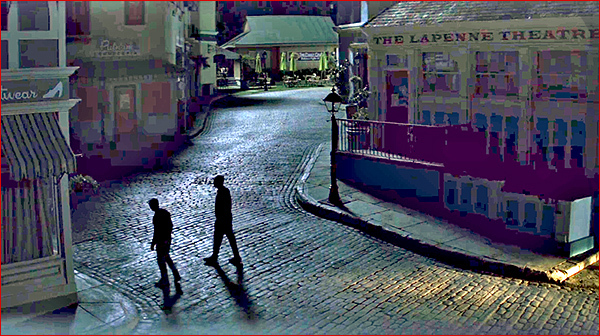 However, you can't really see that much of the set in this "Homecoming" scene , because most of the time the village is draped in darkness, to increase the sense of mystery. The good news is that you can go therein person, easily enough - just take the tram tour at Universal Studios Hollywood, and keep an eye out for Little Europe Street. A. I recognized this one immediately, because I recently did the locations of the hit NBC sitcom, "The Good Place", where the same Universal street is used as the location for that heavenly locale. Once you know it, it's hard to miss those cobblestone streets and fanciful buildings. Obviously, the building above labeled "Your Anticipation Needs" is the same as the building labeled "The Lapenne Theatre" below.